Note: Although my personal exploration of Improv has a spiritual basis, all of the following presentations and classes can be offered in a secular context. That is, with or without reference to god/religion, the ideas and principles I share are helpful in living fully and simply being a good person. I have loved doing the “Sunday Lesson” across the country at Unity churches and many other venues. Let me share about the applications of Spiritual-Improv and a variety of other topics. Let’s play! And put these principles and ideas into use. No improv/acting experience is needed and you are not put in a spotlight to perform in front of people. This is a very safe and supportive environment in which to explore. Learn more about What is Spiritual Improv? Do you have a board retreat or company renewal coming up? These activities and exercises are perfect for ice-breaking, communication, and trust building. And if you want to go deeper we can explore how the points of this “Improv Covenent” can be applied for your organization’s mission. To heck with the holistic stuff – Let’s just learn improvisation! 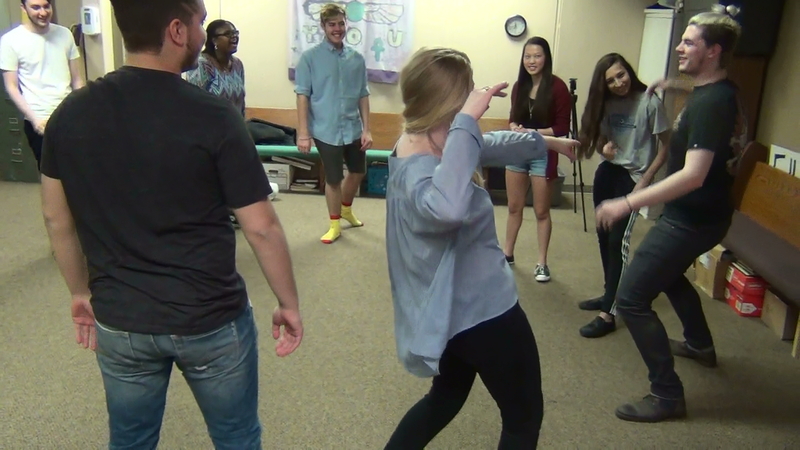 Let me facilitate your personal or group lessons in improv basics. This is great to support your acting, public speaking, confidence,… And it’s plain old fun! With a few volunteers and a bit of preparation we can put on a great show and raise some great funds for your ministry or group!